"I appreciate that creativity may be required to solve a legal issue, and I truly enjoy tackling the what-ifs and what-could-bes that can arise out of a legal question. Understanding the client’s perspective and objectives allows a tailored plan to be identified and put into action." Rilla is an Associate on the Business Litigation team. Her primary areas of practice are Civil Litigation, Business LItigation, Construction Litigation and Public Law Litigation. As part of her practice, Rilla acts for companies and individuals on contract disputes, tort claims, lien actions and collections matters. 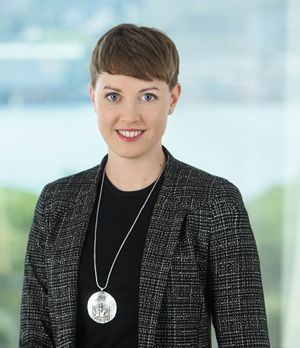 During Rilla’s time at law school, she served a term as Co-Director of the legal clinic Innocence McGill, and represented students subject to the university’s disciplinary proceedings as a Student Advocate with McGill University’s Student Advocacy Program. Rilla now sits on the board of the Halifax Music Co-op. Having stepped out of the competitive boxing ring, Rilla still hits the heavy bag when she has the chance and has recently taken up Olympic weightlifting. In the wintertime, she can often be found next to a wood stove with a book in one hand and a coffee in the other.